Organic wholemeal rye bread with spelt. This organic wholemeal rye bread is made with freshly in-house ground organic whole rye kernels and unsprouted spelt grains, using sourdough. Delicious and healthy, it can be enjoyed as a meal or snack with your favourite topping. 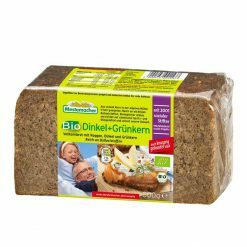 These breads offer many health benefits and are an important source of dietary fibre. All are made from natural rye grain, freshly ground in Mestemacher’s mill, ensuring valuable minerals ae retained. The company uses sourdough rather than chemical additives or baking aids, and its raw materials are sourced from specially tested suppliers. Due to their long shelf-life as a result of pasteurisation, the breads are also highly suitable as emergency food.